Hiranyappa, M Suresh and other Questionable Characters, probably 1987. At MES College, PUC classes began a little after the Assembly (Sanskrit slokas) at 10:15. I would take the 8:45 62 B from Jeevan Bima Nagar and ignore the rather scenic route it took past Cubbon Park, Vidhana Soudha, Park House and Race Course to immerse myself in the entries under some letter in a volume that I never forgot to slip into my bag. It was of uncertain provenance but bore an impressive title–The College Encyclopedia–standing in stiff attention and black-and white lettering below the equally impressive drawing of some tower or spire. I managed to read the damn book through that year–thrice as I remember. I found that copy recently. It seemed to have survived alright, though I couldn’t read the minuscule lettering any more except under a bright light. 62 B would stop at Malleswaram Circle and then speed off to Vijayanagar. I would walk to 15th Cross up Margosa Road, and be dead to everything on the road except the squares on the pavement. These squares were some sort of objective correlative to the voices of excited commentary in my head. He was already 10 points ahead, and so were several others. I was in last place, as could only be expected of a newbie quizzer, and hadn’t even scored. I was beginning to resign myself to this terrible fate, of having qualified only to finish with zero against my name. And then, every day, the same miracle would come to pass. Question after question would suddenly appear from my bus-reading of the past weeks, and I would remember the answers, and he would forget one or two, as would the others. I would go past zero, and not miss a single direct, and pick up two or three passes in every round to make about 16 points. I would eventually win, but never by more than half a point. On days of undue optimism about myself, this margin would stretch to a whole point. At various points during that year, it struck me that this quiz madness was perhaps a little excessive, that I ought to be doing other things. These, alas, were no more than qualms before a fresh storm of inspired guessing began. Now and then some of that inner drama would show on my face or escape my mouth. This may have been the point at which I began scowling upon the world, on sound general principles, a habit which has never left me and proved my undoing so often that it may require a separate post. We will digress only to lament chance encounters with former loves in street-corners and restaurant aisles that uniformly began with them smiling tentatively and ended three seconds later with their withdrawing quickly because the transition from scowl to anything else requires major internal gear-shifting. The above paragraphs may require some explanation. In August 1987, I took part in the Canara Union Lone Wolf Quiz for the first time. I made 12 or 13 in the prelims, and missed qualifying by a point, to my great sorrow. I sat and watched the final, by Raghu Nambiar. It was won by a familiar, well-known quizzer, but this was the first time I was seeing GS Hiranyappa make short work of a quiz all by himself. I knew six of the answers that he gave, and didn’t know any of the other ten. If I had qualified, I might have finished a distant second or third, with luck. That’s how the quiz-madness and the daydreaming started off. I had first come across Hiranyappa’s name in the pages of the City Tab. They had run a two page spread on the KQA sometime in 1985 and one of the photographs had him beaming on the world and the trophy he was accepting, in that order. In the article, he was asked what he thought of the young boys who kept turning up at quizzes with copies of the Manorama Year Book or the Mastermind Quiz Book. He laughed at such foolishness, but very kindly said that these could be the beginnings of something interesting. I began attending KQA quizzes that year, and soon developed much enthusiasm for open quizzes. We would write, not qualify, and then settle down to watch him decimate formidable teams all by himself. For a long time, Questionable Characters, his team, comprised three passengers who had piled on, but all that changed by 1986-87 when M. Suresh and Kiran Natarajan joined the team. They then became even more unbeatable. Hiranyappa used to teach English at RBANM’s College, beside Ulsoor Lake, at this point. A friend of mine named Nakkiran studied here, and he had stories about how good his history was, and how he’d keep digressing and returning. I also learnt that he was nicknamed Potlam, on account of his somewhat portly appearance, and because of the various odds and ends that kept materialising from his pockets. Nakkiran introduced me to him once, and told him that I was eager to join his team, while I stood there with a polite smile plastered to my face. I couldn’t have said anything to him. My heart was at my throat, doing a tight percussion solo. He smiled back politely and said will inform as soon as a vacancy comes up. He did remember to, five years later, but I had already found a team. None of my quiz daydreams of that time ever came true in the precisely detailed fashion in which I had them. In December’87, I qualified for my first Lone Wolf final, but that was all I did. I answered four questions in all, including one on the element Astatine, made five points and finished fourth. Hiranyappa cantered past all of us to fifteen points by the halfway mark, after which we simply lost track. That was also the quiz where I saw Alzheimer’s of the quizzing variety strike Movin Miranda for perhaps the first time. There was a question about a journalist who alleged that Morarji Desai was a CIA informant, to which after much scalping, he said William Hershman. He looked surprised and hurt when I said Seymour Hersh and demanded to know who this Hershman was. Some feller connected to the Bofors scandal. The madness grew worse at this point. I set aside a notebook, and wrote down ten things that could become quiz questions every day. During the summer vacations of 1988 that sprawled from 15th March to 15th June, everybody signed up for II PU tuitions and CET coaching. I bought another encyclopedia and began reading it from cover to cover. I now wrote as many as twenty five questions down every day. All to no immediate avail. In ’88, I gloriously drew a blank at qualifying in both Lone Wolf quizzes. In ’89, I topped the prelims, and then answered two questions in the finals, to finish last. In February 1990, I led from the start, then lost the lead to Dr. Murali Mohan, and then caught up, and took it again, only to see Hiranyappa stage a miraculous recovery in the last ten questions to equal my score. WingCo then did three tiebreakers, through which we remained tied. He then asked us to call on the toss of a coin. Hiranyappa won, and that didn’t hurt as much as the fact that he had stolen my everyday scenario in so doing. I beat him at a Lone Wolf quiz for the first time in Feb 1992, and didn’t get around to wresting the annual title (decided by computing finishes in the two Lone Wolf quizzes of the season) from him till 1994. He was in his sixties by then, and remained a formidable competitor in the Lone Wolf quizzes till about 2002, when failing eyesight limited his participation to team quizzes. Wingco began a Mastermind-style quiz, with topics, titled Super Intellect (now Solus Rex) in 1994. Hiranyappa won the first one, and then came back in 2000 to win the last such contest. In 1993, the newly minted Metaquizziks travelled to Chennai to take part in the British Book Fair open quiz. They had a football-style shootout to finish the quiz, with the top two teams in the finals going through some ten questions. We had led in the finals, but GSH and his team began catching up in the shootout. When they overtook us halfway, we had to endure the sight of seven hundred raucous Chennai buggers standing up and applauding and cheering him on. I particularly remember one jackass in a loud, checked shirt yelling such choice exhortations as apdiye pottu yeitthu, thatha! (‘Just run them over, grandpa’). We squeaked past eventually, and they did not approve of this one bit. 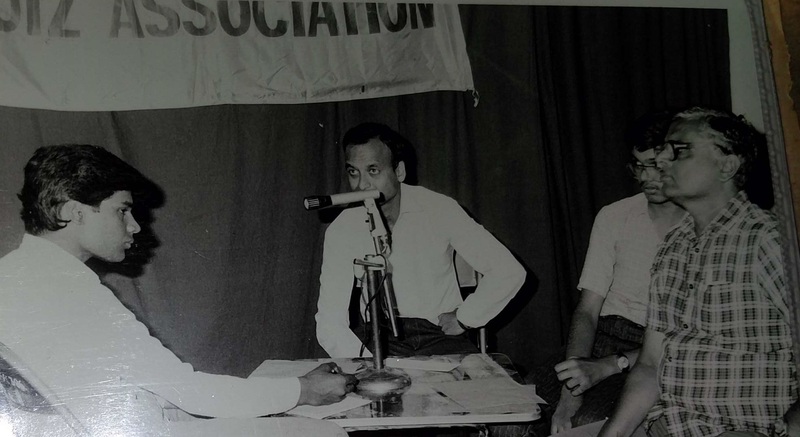 GSH dominated the Bangalore quiz circuit through the 1980s. Hiranyappa was Bangalore quizzing’s first legend, and raised the bar for everybody, both competitively and otherwise. He was very good-natured, and extremely gracious during and after play. I don’t recall him ever getting worked up about winning or losing, or arguing with anybody over points. His big rivals in the 1980s were Dr. Murali Mohan and Movin Miranda. Movin took the KQA solo title from him after two closely contested finals during the 1986-87 season, and then moved on work to Ahmedabad, if I remember right. He came back in September that year to conduct the IIM-B quiz, and while we were waiting at Langford Road, for the IIM bus to cart us all to the venue, Hiranyappa sauntered up to Movin and said I hope you get a really good job that takes you far away from Bangalore. Movin was quick with his reply. If it’s a good job he said, I can keep coming back for quizzes. At which point there was general laughter. He usually arrived grinning at quizzes, and then this broke into an expansive, conversational geniality. Some questions would get an answer, and then an annotation that usually began “In 1935…”, while some groaned and some leaned forward to catch this nugget before it fell to the ground. He was extremely sharp-eyed about young women, and when there were signs of such talent at quizzes, was always the first to go up and say hello. All this was done very gallantly, and in a completely non-creepy way. It caused much heartburn nevertheless among the generally more tongue-tied young fellers. I travelled with him to Kolkata in 1992 for their 25th Anniversary of Quizzing do. On that memorable trip he made many bad jokes, told us scurrilous stories in buzzing swarms, and eventually discovered that there was a small stock of liquid refreshment among us, to dissipate which and consume entirely he promptly joined us. Some of the things that happened on that trip have been rendered accurately via a character in Brahman Naman–Bernie in the film takes his name from Hernie, our private nickname for him. We didn’t dare call him that to his face. My enduring memory of him on that trip is a moment at Broadway Hotel when a complicated breakfast order began arriving in bits and pieces very slowly. Too slowly for him. At some point there was a paratha in front of him, and a chicken cutlet which I think Suresh might have ordered. He seized the paratha, wrapped it around the cutlet, and said this is sufficient for me, and bore it away like a trophy of war to the window. From which eminence he watched Kolkata traffic while chomping on his invention. More trophies, more win, more grin. He was a characteristically Bangalorean figure, in that he contained within himself an ample curiosity about the world, without ever feeling the need to turn into something that he was not. He didn’t pretend, and he cared two hoots for all the little social demarcations that operated in quizzing those days. He was likewise extraordinarily well-read, and given to buttonholing people to press little-known writers upon them. He heard once that I liked poetry, and came up to me and urged me to read Robert Service, especially a poem titled The Shooting of Dan McGrew, and then recited several stanzas of the poem from memory while I stood there squirming. GS Hiranyappa was also the first unabashedly right-wing person I had ever met. He wrote a volume titled Hindu Destiny in Nostradamus, now all over the internet, in which he claimed that this astrologer of sorts had predicted great things for Hindu India. As I remember, the first edition’s nondescript blue cover had one bit in block letters—In 1997, Hinduism will become the rose of the world—possibly a condensation of the book’s points. I remember even more clearly that his preface to the book had a section titled Justification of the Use of Four-Letter Words, in which he apologized for such vocabulary but offered the defence that the direct Anglo-Saxon forms were perhaps the most truthful ways of talking about some historical figures. Nehru, I think, was thus a c**t, or worse. I also remember the normally unflappable Wingco returning from a quiz work-shop at Indian Institute of World Culture, in a bit of a tizzy. All he did permit himself was a terse this chap is too much, I say. This was after an afternoon of India quizzing with young kids where every one of his questions had been followed by GSH letting off righteous steam about the subject of the questions. In 1998, we travelled together to Neemrana for the Mastermind shoot, and while returning got into a political conversation. He didn’t think too much of Periyar, and I had decided to defend him that day, and so at some point we were practically rubbing noses Maori-style and yelling at each other in the front seat while Movin, Souvik Guha and Sabyasachi M who were in the back-seat goggled at us. We cooled down in a few minutes, without outside help, and continued chit-chatting. Later that evening, I went up to his room to see what his travel plans were. He was packing, and said he was getting off at some point to catch another train to Nagpur. Must be a pilgrimage to the big RSS beehive there, I said to myself, and chortled internally. He confirmed this a minute later. Two days later, I watched him get off laboriously from another bogey and walk up the platform. I waved. He waved back, and grinned in a way that bisected the platform. I never understood this right-wing leaning of his. It was a zone where he seemed to stop being the human-scale person he was otherwise, and become an entirely rhetorical being. And yet, as I look at those who share his leanings today, I see that he was probably haler and saner than all these ideological contemporaries. You could argue with him, at the very least, and be assured that he would conduct himself with dignity, and never stoop to mere name-calling—he would neither call you anti-national nor dismiss you as merely dhimmi . He was 81 when he passed away two weeks ago. I am richer for having known him, and poorer today, for one part of my own life becomes smaller with his going.